There are thousands of wine grape varieties in the world, and yet many of us find ourselves defaulting to the same grape type every time we reach for a bottle. Time to branch out? I think so! There will always be a place in my glass for our mainstream friends like Chardonnay, Sauv Blanc, Pinot Noir and Cab Sauv, but there are so many little jewels out there to discover, and who knows – you might just find a new favorite! Here are four underrated grapes you may not have met before. As one of the grapes in Hungary’s famed dessert wine ‘Tokaji’, the Furmint grape rarely gets the credit it deserves outside of Hungary. It produces deliciously complex dry white table wines. Expect beautiful minerality and exotic aromas of orange spice and almond, complemented by bright citrusy acidity and stone fruit. Traditionally grown in Burgundy, Aligote has a tough job competing against its more popular white Burgundian counterpart – Chardonnay. But trust me, this little guy deserves a chance! The wines are flinty with mineral notes and flavors of lemon, grapefruit and green apple with refreshing acidity. This powerful grape can be a force to be reckoned with! 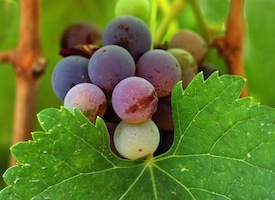 Historically grown in South West France, Tannat is now considered the national grape of Uruguay. Plantings are also increasing in Argentina. The wines are big in body with bold tannins and flavors of cocoa, figs, plums, jammy fruits and licorice. Pretty, aromatic and Pinot Noir-like, Zweigelt is Austria’s most widely planted red grape variety and is now digging its roots into Canadian soil. The Okanagan Valley is proving to be a natural home for this delicate grape by producing soft, cherry-noted wine with subtle, peppery spice, velvety body, and soft tannins.